What to eat on Good Friday and Easter weekend. Well, if you celebrate Good Friday for the day that it is, you will not be eating any flesh from warm-blooded animals, and if you’re reading Fish on Friday, there’s a high possibility that fish will feature on your plates at some point this weekend. With so many species to choose from, particularly if your Fishmongers can source from Billingsgate, a whole world of varieties opens up. But, let’s possibly rule out a few to avoid, not because they are not nice, nearly all fish is nice, but some fish have just gone through their breeding cycle and are out of condition, ie, very little “meat” on their bones. In particular, flat fish, Plaice, Lemons, Dovers, Turbot, etc. So, with some bottom feeding fish out of the equation, let’s look to round fish in the mid to top water. 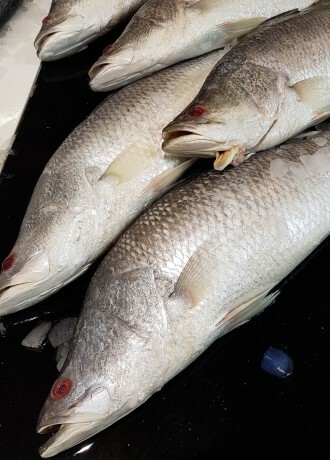 Right now, I would highly recommend a very under-utilized species which is very common in Australia and the Indian Ocean – Barramundi. Barramundi, also known as Indian Sea Bass, but commonly associated with the Perch family, has a pure, white, chunky, flakey, juicy meat. It will cook up similar in colour and texture to that of Cod. Avoid “some” fresh Cod right now as it’s breeding, and the market is very sadly inundated with Cod Roe. Look out for MSC-certified Cod however, and choose this when it becomes available. You can choose between both wild-caught and farmed Barramundi, the choice is yours for this very tasty fish. If you’ve got the family for dinner this weekend, why not go all out and cook up a very simple but highly impressive fish pie. Go to your fishmonger and buy the bits he might be struggling to sell, like the “off cuts”. 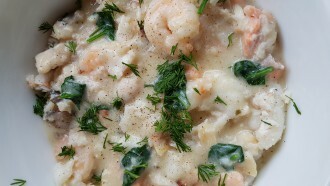 Some Fishmongers are producing bags of Fish Pie Mix now, as they are becoming more popular. They include a mix of white fish, salmon and smoked fish. If your guests have no allergies, whack some prawns and mussels in too for extra luxury. If I was to go for a bottom-feeding fish, or a fish that will grab what takes its fancy, this weekend I could think of nothing nicer than a (in the voice of Craig Revel Horwood) “gorgeous darling” mouth-watering Cornish Monkfish. Again, if the family is coming over, how about a Thai Green Monkfish Curry done in the slow cooker. Alternatively, there is little easier, than Monkfish and Sweet Potato Chips with a nice sweet chilli dip. If you go down the Monkfish route, an important thing to remember is the secondary skinning of sinewy skin – this must be removed, or you’ll end up with chewy, hard monkfish. Enjoy “fish on Friday” and have a happy Easter. Featured image by George Rex, CC BY-SA 2.0. In text images and text by Fisheries Inspector Robert Embery, Fishmongers’Company.